For our most popular menu item, we use wild caught salmon, beer-battered with our Kayaker Cream Ale tempura batter. 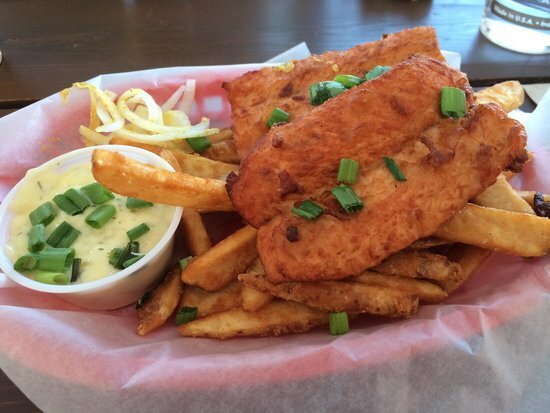 Two 3 oz golden fried salmon pieces sit on top of a mound of beer-battered fries. Our house-made remoulade is nestled deep with our house-made creamy coleslaw to complete the fish fry platter. This menu item has been a solid staple since we created our first menu over 10 years ago! When Tony and I travel we are always researching different menu ideas for Pagosa Brewing Company. Some of them are implemented and others can’t be duplicated or just don’t appeal to our customers, we get that. And we still have fun with all the menu testing of ideas that we gather from our trips together. I have a fondness for salmon and I love the trips up to the Pacific Northwest for that reason. Tony always jokes that he tries to feed me salmon for every meal while we are visiting. On this particular trip to the Pacific Northwest in 2008, Tony and I wondered to the Pike Street Market in Seattle, Washington. We watched the fish boys tossing fish, rubbed the head of the bronze pig, walked by the artisan stalls ogling their pieces. We were on a mission for a fresh caught fish lunch with Tony’s mom in tow. We stopped by one of the local food vendors and found seats empty where we parked ourselves for the duration of our meal. Knowing we would be in for some good food, we ordered some craft beers to wash it down with to start. Mom ordered a deep fried whole crab. Tony ordered fresh caught deep fried halibut and fries. Can you guess what I ordered? Of course the meal was delicious and we knew that both salmon and halibut were unique fish to make fish fry out of. We decided that we should try to put it on the menu we were developing for our initial wanderings into the food part of Pagosa Brewing Company. When we shopped around we found that halibut was not sustainable and was very pricey, however, the salmon we could get was wild caught and for a price we believed people could appreciate. When we tossed the salmon into our beer batter mixed with our Kayaker Cream ale, we knew we had a winning menu item. Add our delicious golden beer battered fries, house-made remoulade and our own creamy coleslaw and you could be sitting in the food vendor stall up in the Pike Street Market in Seattle, Washington. Except ours was better because we could wash it all down with one of our very best hand crafted beers from our own Pagosa Brewing Company. So next time you join us for lunch or dinner, if you haven’t tried the salmon fish and chips, you should! Our Kayaker Cream Ale pairs perfectly, of course, the same beer is used in the batter for the salmon. And the fries can be reheated the next morning for breakfast because they are that good.